Honestly, I’ve never met a mushroom I didn’t like. When I was in culinary school, I had a final exam in an Asian cuisine class that required me to memorize 40 or 50 ingredients including a lot of mushrooms. That’s when I became familiar with an amazing assortment of fresh and dried Asian mushrooms. So began my lust for mushrooms. This salad was inspired by a dish I had during happy hour at Palomino Restaurant in San Francisco. It’s so simple to make and a delicious light meal. I used boneless skinless chicken breasts which I don’t prefer but had available. I prefer a boneless skin on breast because skinless can be dry without brining. Sometimes people ask me why I add canola oil to some of my salad dressings. I know its very popular to put extra virgin olive oil on everything and lots of it. When I lived in Italy it would have never considered putting anything other than evo on a salad. The food grown there complements the oil. However, for the most part American food doesn’t taste like Italian food in Italy so I don’t follow the pack on this one. Sometimes, olive oil overpowers flavors in a salad and canola oil is lower in saturated fat and higher in omega-3 fatty acids than olive oil. Don’t miss the tips for variations at the end of the recipe. For the chicken, marinate the chicken in lemon juice, salt, and pepper for 15 minutes. Heat the olive oil on medium high heat and add garlic. Cook until brown and remove then add chicken and juices. Sear the chicken until it’s brown, turn and add whole spigs of thyme to the pan. Cover and continue cooking chicken until done, about 10-12 minutes. Covering the pan creates a quick pan sauce to which you can add the juice of half a lemon. Trim the stem of the mushroom down to the cap but don’t remove the core. It’s needed to give the mushroom texture. Heat one tablespoon olive oil over medium heat and add garlic. Cook until brown and then remove. Increase heat to medium high and add mushrooms, season with salt and pepper. Cook mushrooms until brown on both sides and liquid has evaporated. The mushrooms are cooked when they’re soft but still have texture in the center. Remove from pan and set aside. For the dressing, put the vinegar in a small bowl with a pinch of salt, whisk in canola and olive oil. This will make extra dressing for another use. Use a potato peeler to shave off a few slices of cheese. Place the greens in a bowl with two tablesoons of dressing, pinch of salt, and mushrooms. Mix together and serve alongside chicken breast drizzled with pan sauce. Peel the thyme leaves off and sprinkle over chicken, garnish salad with parmesan curls. Variations: this salad works great with medium soft goat cheese and grilled bread or a goat cheese crostini. 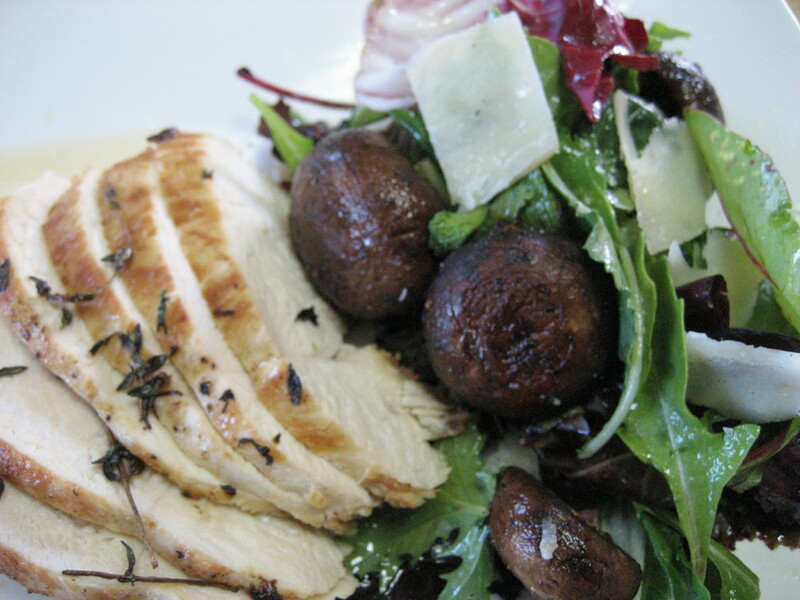 This entry was posted in Poultry, Recipes, Salad and tagged chicken, diet, healthy, lemon, light, mushrooms, parmesan, salad. Bookmark the permalink.